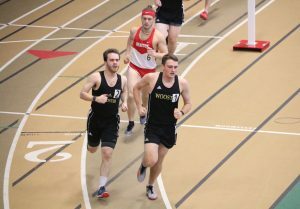 The men’s and women’s track and field teams performed brilliantly at the Fighting Scots Invitational on Saturday, Jan. 26, as Wooster finished first out of the six schools competing on both the men’s and women’s sides. Along with the usual student-athletes, Dean of Students Scott Brown decided to participate in the 60 and 200 meter dashes. On the women’s side, Wooster athletes finished first in five different events. Taking home top honors individually were Isabelle Hoover ’22 in the 3000-meter run, Carolyn Webster ’19 in the high jump, Georgia Hopps-Weber ’21 in the pole vault and Akwia Tilton ’20 in the long jump. The team of Emani Kelley ’19, Maya Vasta ’22, Cobi Warstler ’20 and Audrey Cordova ’20 combined to claim the win in the 4×400-meter relay. Along with the first-place finishers, many other Wooster women also finished near the top of the leaderboards. Korri Palmer ’20 nearly won the 60-meter dash, finishing just 0.28 seconds behind the winner, Aishat Sadiq ’19 of Earlham College. Palmer also came within a second of victory on the 200-meter dash, finishing fourth. Vasta earned second place on the 60-meter hurdles, coming in 0.46 seconds behind Allegheny College’s Tori Valachovic ’20. Claudia Partridge ’22 was just behind Webster on the high jump, Webster closely trailed Tilton in the long jump and the team of Warstler, Cordova, Kelley and Hoover finished second out of six schools in the distance medley. “The women’s team had a lot of individual wins that led to a team win,” Hopps-Weber said. “I know all of us have the potential to improve over the season, which hopefully will lead to more successful meets like this one. I am especially excited to see how the first years’ seasons go, considering quite a few made a strong start to the season by winning Wooster some points in the meet,” she said. While the women’s performance was outstanding, the men were arguably even more successful, as they won eight different events. William McMichael ’22 took first place in the 400-meter dash, and Matt Klonowski ’21 was victorious in the 800-meter run. David Westcott ’19 came out on top in the 5000-meter run, while Jordan Dennis ’19 did the same in the 600-meter hurdles. Kristian Coleman ’22 took home top honors in the triple jump. Wooster also had four of the top seven finishers in the 200-meter dash, although Wittenberg University’s Brandon Johnson ’20 just beat out Wooster’s Drake Pence ’21 for the top spot. Along with the individual accolades, all three of the men’s relay teams were tops in their events. The team of Pence, Coleman, McMichael and Myles Parker ’19 won the 4×200-meter relay, while McMichael, Brian Lief ’19, Matt Olszewski ’21 and Parker won the 4×400. In the distance medley, Aedan Pettit ’20, Simon Weyer ’19, Klonowski and Lief teamed up to defeat Earlham by over a minute. The track and field teams will next compete next at the Bob Shannon Invitational at Denison University in Granville, Ohio on Saturday, Feb. 2. Coral Ciupak - who has written 220 posts on The Wooster Voice.